This is why like your way and the NCN in general there's just something awesome to learn here everyday and I am not sure I learned by intention or if they're presented to me by reason or if they just are. So you're saying that if we define any process we've taken away from the ability to understand it and therefore in order to understand any thing we can neither abstract nor define it as it appears in and of relevance to the object. So it basically doesn't do any good to frame an understanding of any thing because that will prevent us from understanding. So then I must also apologize for framing you sir as an evolutionary triggers man and NCN as an evolutionary trigger, so sorry about that. The Cognitive Symmetry-Breaking by Nicholas Williams link was a major lesson in expandable thinking and both this log entry and that article are brilliant pieces of logic. I'll have to go back and read again, perhaps the George Lakoff article you put in a few logs back as well. Perhaps I should be framing things much differently. One of the big problems with words and thinking it out side the box. Or creating a box to think out side of. This is why I like telepathy so much as a thinking tool; there seems to be no box or limit that is not expandable or even there. It's kind of open and apparently doesn't frame the same as words. Thanks for this one. About breaking cognitive-simmetry, it's the same or, better, the complementary of cognitive dissonance, maybe you'd be interested in it. 25 Sep 2004 @ 16:21 by lugon @80.58.19.44 : not deframing but reframing? When talking to each other we use words and concepts, and at least in many situations I currently see no way of avoiding that. So maybe one needed trick is to at least realise that our current framing (or the framing we're being kindly offered by CNN or whoever) is but one alternative framing. Knowing we can reframe, and knowing how to do it, is not the same as deframing, but at least it's better than accepting whatever current frame as The Frame. Others have suggested we might not treat words as boxes, but rather as sticks on the ground: reality is somewhat closer to stick A and not as close to stick B. This would reframe the whole reframing issue? I'd say words are like a pointing finger. They point to some phenomenon. They also carry with them certain references and contexts and suggest certain filters for interpreting what we're looking at. It is of course very useful to be able to point something out, and look at it together, and refer to it later. It would be safe to say we couldn't survive without it. 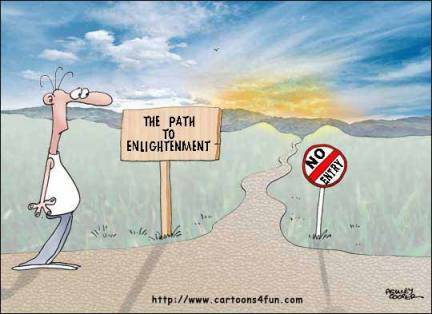 Even the most enlightened human can't do without being able to distinguish certain things from other things. So, no, it is of course not bad in itself to try to define things. Wouldn't be any point is being here talking if we couldn't. But it is when we forget that we're merely pointing that we get in trouble. When we start thinking that the finger pointing to the moon IS the moon. Which is what we're doing a lot of the time, even if we'd tend towards denying it. The antidote is not to stop defining things, but to always be aware of the fact that we're doing it. That we're abstracting. That we're pointing to something that is always more complex than that which we use to point with. Always being aware of the frame is, I think, another way of putting it. And being ready to reframe at any time. Or deframe, if the frame isn't serving us. Always knowing that the word is never the thing. The frame is never THE frame. language as 'a greasy currency' and 'a virus'. If the way phenomena & persons appear to us are not they way they actually exist, then whether we look at a large mysterious universe or a confining concept, then we still haven't grasped it. 27 Sep 2004 @ 06:38 by Lion Kimbro @216.254.10.144 : We need to be able to live both worlds. We need to be able to both sign, and to see things as they are. When we get into worlds that we can have no direct vision of, and have to rely almost entirely on sign- that's when things get really out of whack, it seems to me. Alas Ala ha ha I didn't get it first, I'm not sure I get it now, but I was out shovelling some sand from the end of the drive to the other, moving sand from one place, uphill to another and then realizing that the same sand was simply flowing back to the same place as it started from, each time it rained. So in my above comment all I did was reiterate and reframe regardless of intention. By choice of word I still stayed in the frame and thus still delivered the same message. I wrote in another blog here about names and I indeed do botch , names, labels, titles, intention, reality itself, awareness and many other things quite constantly. But there's always something to learn in just about anything that happens or more probably everything that happens. Remembering the learned and or the done at the right time is quite difficult. So how about sorry for any labels, names or other descriptions that suggested that formulation and its boundaries. Or does any reference still keep you in the frame?.... well thanks Ming, , Jstarr and others. ..by the limitations of labels, names & other descriptions - as long as we don't take them for the real thing. Whatever that is! "But there's always something to learn in just about anything that happens or more probably everything that happens."